Soil is a living entity. It contains various micro floras like bacteria, fungi, actinomycetes, nematodes, protozoa, arthropods and earthworm etc.Various human activities like cultivation of crops or developing an infrastructure etc changes the habitat of various life forms of the soil. The sustenance of these soil life forms i.e. microorganisms and other micro flora is essential to keep the soil alive and healthy. Watershed through its various interventions emphasize on enhancing the soil health by giving priority to organic agriculture .It ensures the use of FYM, compost, green manuring etc. in the watershed so that the soil can have sufficient carbon stock in the soil. Watershed aims at ensuring the diversity of crop in the watershed boundary. This helps in enhancing the presence of different essential microorganism in the soil. That’s how the appropriate habitat management is addressed through interventions of watershed. Biomass plays an important role in protection of different life forms .Agriculture is an important component of watershed that provide the livelihood to the families in watershed. Sustainability of their livelihood can be ensured through providing sustainable agriculture. The watershed management through the use of organic agriculture ensures that that the farmers in the field are ensuring the presence of diversified forms of microorganism that can help in maintaining soil fertility and productivity in the soil. 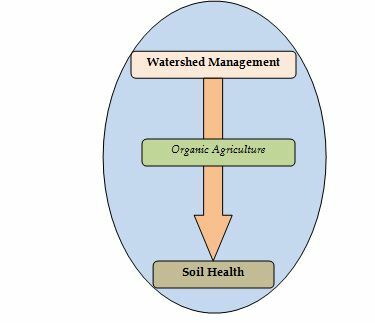 Watershed management by adopting organic agriculture ensures all types of foods required by micro flora and other essential life forms. Sufficient dry organic matter for the small insects, fully decomposed organic matter for microorganism and semi decomposed organic matter for the earth worms are required for the survival of diversified micro flora in the soil. 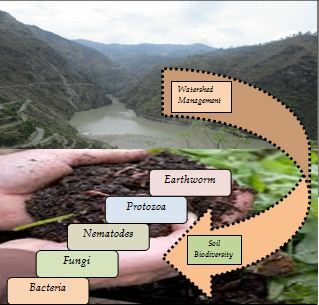 Watershed interventions are vital in ensuring soil diversity and crop diversity so as to maintain a habitat for the survival of essential soil micro flora on sustainable basis.